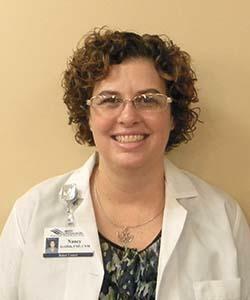 Nancy Griffith, FNP, CNM is a family nurse practitioner and a certified nurse midwife. She has lived in the mountains of Avery County since 1993 and enjoys providing healthcare to families in our community. Nancy has a diploma in nursing from Mercy School of Nursing in Charlotte, a Bachelor of Science in Nursing from UNC Charlotte, a Master’s Degree in Nursing from UNC Chapel Hill and a Post-Master’s Certificate in midwifery from Frontier School of Midwifery and Family Nursing. She is married to Reo Griffith and they have two children Abigail and Robert Benjamin.